Master Chef Series There are 8 products. Corbara’s Chef Uniform: discover the unique style of the Master Chef Jacket and Apron. 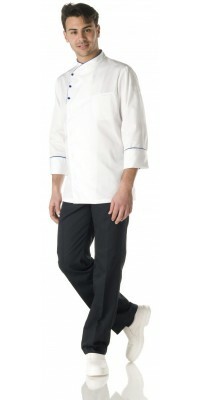 This chef uniform is dedicated to those who prefer a jacket with a unique and recognizable style: the Master Chef Jacket, in fact, is different from the classic jacket because of the special side buttoning, with three stud buttons in view and hidden snap fasteners; the outer buttons and the outlines on the neck and arm sleeves give a pretty touch of colour. There are three colour alternatives: the white of the jacket can be matched with Black, Burgundy and Royal buttons and outlines. The Master Chef jacket is made of lightweight 50% cot. 50% pol. Soft-feel Gabardine, a comfortable and wash-guaranteed fabric. In order to complete this chef uniform, an accessory is essential: the Apron, available both in the white version with borders coordinated with the jacket and in the contrasting one – with white border – for those who prefer a coloured apron. The aprons are made of wrinkle free 100% polyester Gabardine Plus. 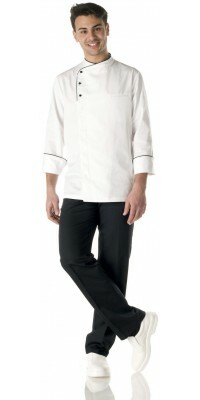 Master Chefs' White jacket with Black profiles and side buttoning One pocket on the breast and one on the left sleeve three pull-out buttons and four hidden snap fasteners Immediately available for delivery: sizes from S to XL Made of Lightweight Soft-Feel Gabardine, 50% Cot., 50% Pol. Apron with waist band, model Gran Maestro Black colourwith white profilesize cm 85 x 95Made of Gabardine Plus, 100% Pol. Apron with waist band, model Gran Maestro White colour with black profile size cm 85 x 95 Made of Gabardine Plus, 100% Pol. Master Chefs' White jacket with Burgundy profiles and side buttoning One pocket on the breast and one on the left sleeve three pull-out buttons and four hidden snap fasteners Immediately available for delivery: sizes from S to XL Made of Lightweight Soft-Feel Gabardine, 50% Cot., 50% Pol. Apron with waist band, model Gran Maestro White with burgundy profile size cm 85 x 95Made of Gabardine Plus, 100% Pol. 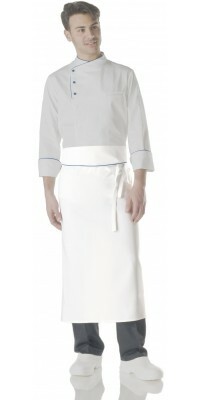 Master Chefs' White jacket with Royal Blue profiles and side buttoning One pocket on the breast and one on the left sleeve three pull-out buttons and four hidden snap fasteners Immediately available for delivery: sizes from S to XL Made of Lightweight Soft-Feel Gabardine, 50% Cot., 50% Pol. 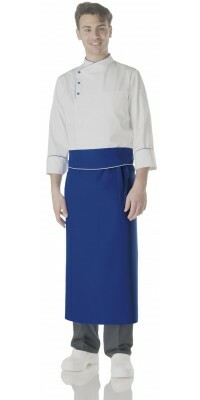 Long apron with waist band, model Gran Maestro Royal Blue, with white profile size cm 85 x 95Made of Gabardine Plus, 100% Pol. Apron with waist band, model Gran Maestro White with royal blue profile size cm 85 x 95Made of Gabardine Plus, 100% Pol.